With Their Eyes On November, The PACs Of Interest Groups And Lawmakers Are Collecting A Record Amount Of Money, According To Disclosures. Who’s Gathering The Most? Answers Here. 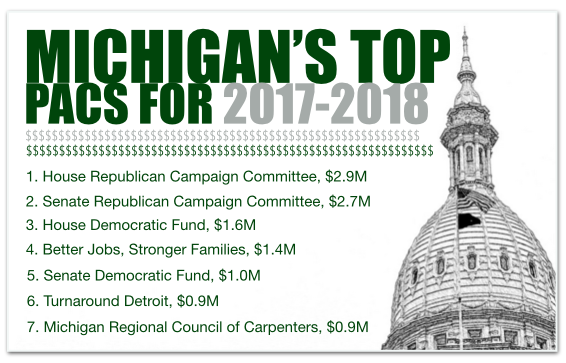 LANSING (MAY 4, 2018) — If the amount of money flowing to interest groups is any indication, Michigan’s 2018 election could be unlike any other the state has seen. 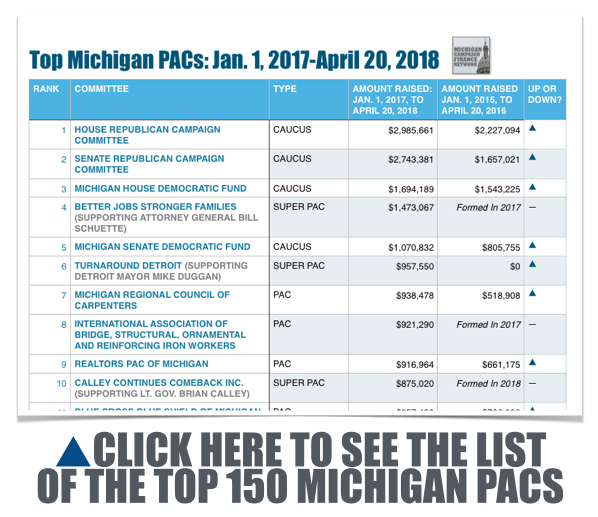 As of April 20 — 200 days before the general election — the top 150 political action committees (PACs) in Michigan had collected $34.5 million, according to an analysis of campaign finance disclosures. That total is a record for this point before a statewide election. Two trends seem to be driving the total upward. For one, committees connected to state lawmakers are raising more money than before. For another, Super PACs, groups that are meant to act independently of candidates and can raise unlimited amounts of money from corporations, are multiplying and attracting larger donors. The PACs are focused on this year’s elections, in which Michigan voters will eventually choose a new governor, a new attorney general and a new secretary of state. They’ll also fill two seats on the Michigan Supreme Court, all 38 seats in the state Senate and all 110 seats in the Michigan House. Michigan voters elect a governor and the state Senate every four years. In 2014, Republican Gov. Rick Snyder won re-election in what was the second most expensive gubernatorial race in state history. As of April 20, 2014, the top 150 PACs — the PACs that had raised the most money — had collected $32.0 million since the beginning of 2013. The $34.5-million total from Jan. 1, 2017, to April 20, 2018, is up about 7 percent over the 2014 total. In 2010, when Snyder won his first term as governor, the top 150 PACs had raised only $19.8 million at this point. A list of the top 150 PACs in Michigan from Jan. 1, 2017, through April 20, 2018 is available at this link. Four of the top five committees are groups that raise money on behalf of the legislative caucuses. The House Republican Campaign Committee, which is No.1, has raised $2.98 million. The Senate Republican Campaign Committee, which is No. 2, has raised $2.74 million. The House Democratic Fund, which is No. 3, has raised $1.69 million. And the Senate Democratic Fund, which is No. 5, has raised $1.07 million. Information about those committees’ top donors is available at this link. With 16 Super PACs making the top-150 list, Super PACs are poised to play a larger role in 2018 than in past statewide elections. Super PACs are different from traditional PACs because unlike traditional PACs, Super PACs can accept unlimited contributions from corporations. And while traditional PACs can give money directly to candidates’ campaigns, Super PACs have to spend their funds independently of the campaigns. As of April 20, 2016, there were 14 Super PACs among the top 150 PACs. None of the 14 had raised more than $500,000. As of April 20, 2014, there were nine Super PACs among the top 150. Only one had raised more than $500,000. This year, however, three Super PACs have already raised more than $500,000, and all three rank among the top 10 PACs in the state. The most active Super PAC has been Better Jobs, Stronger Families, which is supporting Republican Attorney General Bill Schuette in his campaign for governor. The Super PAC has raised $1.47 million and spent $134,100 on TV advertising, according its campaign finance disclosures. A majority of this Super PAC’s haul has come from just four donors: Kojaian Properties, which gave $250,000; Oakland Financial Corporation, which is connected to the Moroun family and gave $250,000; MadDog Technology Chairman Peter Karmanos, who gave $250,000; and the Penske Corporation, which gave $150,000. Another Super PAC, Turnaround Detroit, ranks as the sixth largest PAC. It has raised $957,550 and spent heavily to support Detroit Mayor Mike Duggan in his successful re-election campaign in 2017. Its top donors have been Penske Corporation owner Roger Penske, who gave $250,000, the Michigan Regional Council of Carpenters, which gave $150,000, Powering the Economy, a Super PAC connected to the Detroit Regional Chamber, which gave $125,000, and Central Transport, a Moroun family company, which gave $100,000. 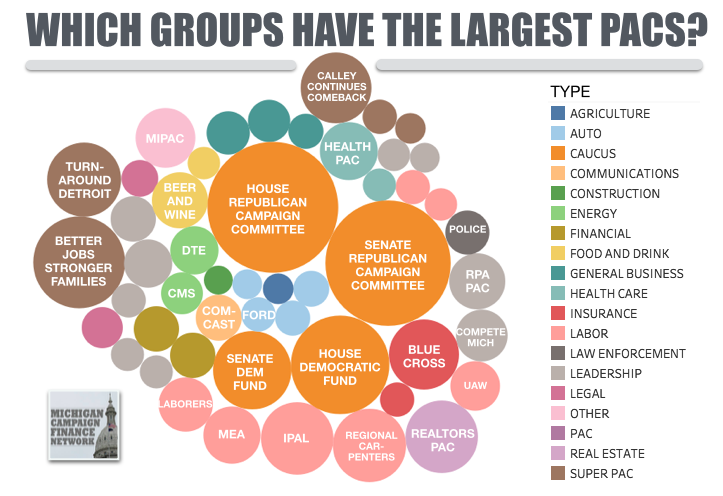 The 10th largest PAC is also a Super PAC. It’s Calley Continues Comeback Inc., which is supporting Republican Lt. Gov. Brian Calley in his campaign for governor. The Super PAC has raised $875,020. Most of its money has come from just three donors: Kelly Services Chairman T.E. Adderley, who gave $250,000; Northwood Group CEO William Parfet, who gave $250,000; and DP Fox Ventures President and CEO Daniel DeVos, who gave $200,000. Daniel DeVos also gave $250,000 in February to MIPAC, which is not a Super PAC but is another PAC supporting Calley in the race for governor. Because Super PACs face few restrictions on their fundraising abilities, new Super PACs could pop up in the months before the election, raise large amounts of money quickly and spend it quickly. If you want to see another trend in Michigan campaign finance, look to so-called leadership PACs. These are PACs connected to individual officeholders that the officeholders use to raise money to support their preferred candidates and causes. Before the 2014 election, no individual leadership PAC had raised more than $200,000 as of April 20, 2014. As of April 20, 2018, five leadership PACs have raised more than $200,000, and a handful of others were close. The largest leadership PAC belongs to term-limited Gov. Rick Snyder. His Relentless Positive Action PAC, which has been running ads to support Calley, has raised $550,128. Its top donors have been Penske, who gave $250,000, Parfet, who gave $100,000 and PVS Chemicals CEO Jim Nicholson, who gave $50,000. Compete Michigan, the PAC of state Sen. Mike Shirkey, a Republican from Clarklake, is the second largest leadership PAC. Shirkey is expected to be the next Senate majority leader if Republicans retain control of the Senate. His PAC has raised $467,091. The PAC’s top donors have been members of the DeVos family, who combined to give $50,000, Autocam CEO John Kennedy, who gave $40,000, and Jon Cotton, a Meridian Health executive, who gave $25,000. State Rep. Lee Chatfield, a Republican from Levering, has the third and 10th largest leadership PACs. Chatfield is expected to be the next House speaker if Republicans retain control of the House. His Chatfield Majority Fund and Chatfield Majority Fund 2 have raised $406,876 and $123,330 respectively. Top donors to his PACs include businessman and Michigan Republican Party Chairman Ron Weiser, who’s given $50,000, and the Michigan Chamber of Commerce, which has given $30,000. Kennedy and Cotton have each chipped in $30,000 to Chatfield’s PACs as well. Like Chatfield, term-limited Senate Majority Leader Arlan Meekhof, a Republican from West Olive, also has two leadership PACs on the top-150 PAC list. His Moving Michigan Forward I has raised $359,457, and his Moving Michigan Forward II has raised $206,625. The most active leadership PAC connected to a Democratic officeholder is Duggan’s Duggan Leadership Fund. It launched on Jan. 24, 2018, and has already raised $191,451. The PAC’s top donors include Blue Cross Blue Shield, which gave $10,000, Miller Canfield, which gave $10,000, and Pistons Vice Chairman Arn Tellem, who gave $10,000.